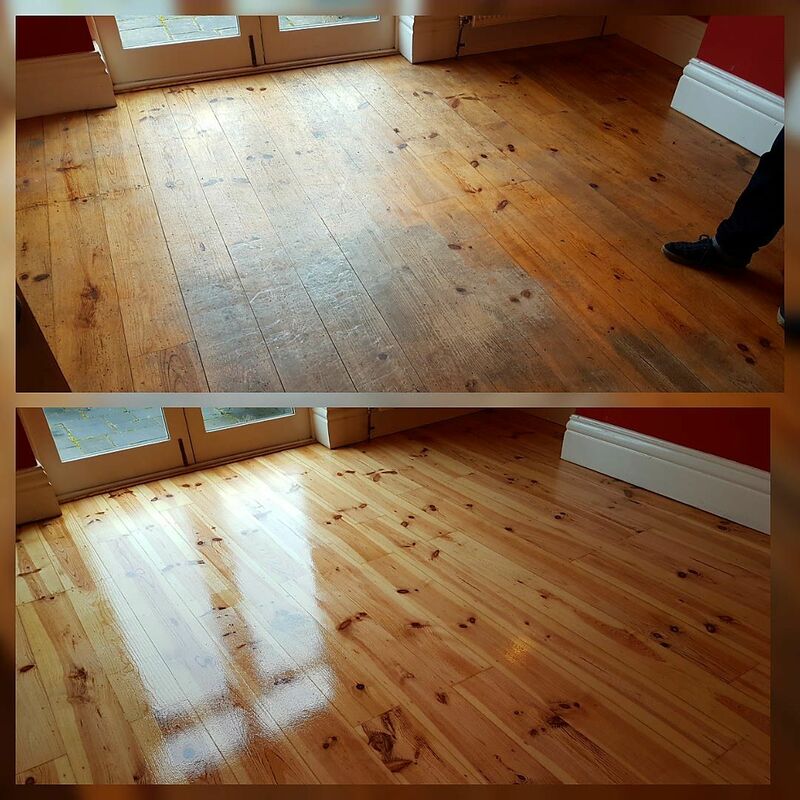 Professional wood floor sanding and re-finishing services in Hull, York, Beverley, Driffield and surrounding areas. Different types of wood floor require different types of protection. Using over 30 years of experience, we can sand your floor using our dustless floor sanding process and restore it to its former beauty, treating the wood with a protective layer before finishing the floor with oil or lacquer. If your wood floor does not need sanding at this time we can simply clean it using the appropriate wood floor treatments and finish it with oil to bring it back to life. We will always take a look at your floor before giving you a quotation. Wooden flooring needs specialist care and treatment to keep it looking its best. This flooring had sadly been neglected for too long, and when the client called us we came up with a plan of action. The dirty areas show where the original lacquers had worn away, leaving the floorboards open to dirt and water damage. There was also evidence of where high-heeled shoes had caused indents in the wood. We used our dust-free sanding and refinishing process to restore the floor to its former glory. The results speak for themselves, and they now have a wooden floor to be proud of. It doesn't matter whether you have pine floorboards, solid hardwood, engineered hardwood or a parquet floor we are able to sand and refinish your floor whatever the condition we find it in. Our multi-stage wood floor restoration procedure will make scratches and indents from heels disappear and create a beautiful, durable, slip resistant finish. This method is specifically formulated for heavy traffic on commercial and domestic wood floors. When it comes to sanding wood floors and hardwood floor refinishing our, easy-to-use online form enables you to contact us outside office hours. We'll get back to you as soon as we can!